Successfully Added Ugoos AM3 Android TV Box - 4K, Android 6.0, Octa Core CPU, 2GB RAM, Kodi 16.1, SPDIF, Mali GPU to your Shopping Cart. Ugoos are back with their latest model that is sure to be a hit for 2017, the AM3. This TV box from established smart TV box specialist Ugoos has a great lineup of specs and features and comes at a cheap price. This Android TV box is rocking the Amlogic S912 Octa Core CPU, It has 4 cores running at 1.5GHz and a further 4 at 1GHz which when combined with the 2GB of RAM provide plenty of processing power. TV box also benefits from the Mali T820MP3 GPU so it's no slouch in the graphics department and can easily handle streaming movies. Of course, all this will also let you play games without dropping frames or experiencing lag. making it a great addition to any living room. The AM3 TV Box is a compact and unassuming black box but don't let its plain looks fool you. With its aluminum body there's good heat dissipation allowing for a fan-less design so it runs quietly so there's no distractions or interferences. You'll be able to enjoy 4K video support and with a plethora of ports including 3 USB, SPDIF optical out, LAN and SD card you have room for lots of extra storage as well as game controllers and peripherals. thanks to the wireless network properties you'll have greater freedom to use the TV box in any room around your home. 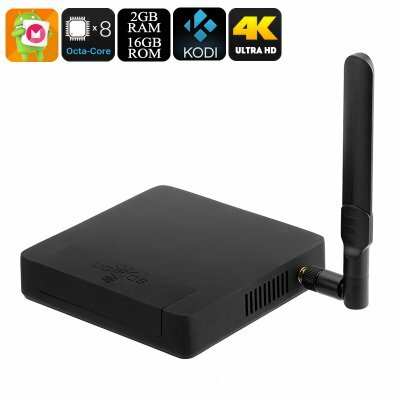 Coming with all the usual extras including remote controller, HDMI lead, large Wi-Fi antenna and power adapter you'll get everything you need for some great entertain to suite all the family in this one compact TV Box. The AM3 TV Box from Ugoos comes with 12 months warranty, brought to you by the leader in electronic devices as well as wholesale Android TV boxes and mini PCs..